On Wings of Eagles: The price for God's Word. The price for God's Word. Today I want to think about a time when a heavy price was paid for a translation of our Bible. 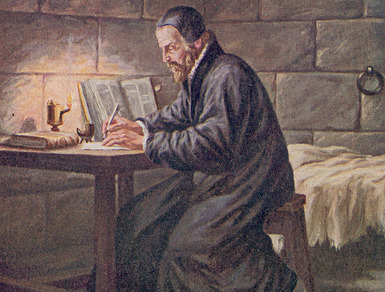 William Tyndale, a 16th century Englishman, translated the Bible into English while living in Germany. Finally, in 1525, he was able to publish a New Testament in English. But the church authorities at the time were not pleased and they angrily sought to destroy Tyndale and his translation. Finally, he was caught and brought back to England where he was burned at the stake. As he was dying, he uttered these words: "Lord open the eyes of the King of England." His prayer became a prophecy, as it was the King of England, King James, who finally did publish the entire Bible in English about a hundred years later. Our English Bible translations became a reality through William Tyndale's heroic sacrifice and bravery, ultimately at the price of his lifeblood. This Independence day, don't let your Bible sit on the shelf gathering dust. Considering the cost that was paid so you could read it in your native tongue, let's all take full advantage of this precious gift. The freedom that we so enjoy on this day is only a taste of the real freedom we have in Messiah; the promise of eternal forgiveness and freedom from sin. The cost of that freedom was the precious blood of the savior Jesus. William Tyndale offered his life so we could read about this spiritual freedom in our own language. As we celebrate our earthly freedoms let's not forget to also give thanks for our eternal liberty that we find in our Lord. Dear Lord, we thank You for Your word and the availability of it so we can read it and learn what You have for each of us. In the Name of Jesus, Amen.